Rain, rain go away was my cry for two days as I set in the house in the Bahamas. I left the snow to go to the Bahamas to handle some business, and I wanted the sun. You know we all want what we want and when we want it. Somehow, it was taking longer than I anticipated. So, what do you do? I just made inside fun happen with my kisses and Brelyn. How many times have things not gone the way that you have expected? What did you do at that moment? Especially when you cannot change what is currently happening. Life will throw things at you that you never planned for, but you have to learn how to make the best out of every moment regardless. Never let them see you sweat! I don’t know who them is, but you know. I am working hard at growing up this year. I have identified areas in my life that need work. I refuse to be in the same place next year, and I am not giving myself that long either that just sounds good to say (LOL). I have learned that change is a matter of making a decision, so I have decided to be better. Moving on, I am sitting here in the Bahamas thinking about the goodness of God. I have four of my kisses with me. Last night at about eleven pm I took the oldest one, Konner outside with me to walk around the property. We stopped periodically to enjoy the view. I looked at him and said, “God did this, and we always have to be grateful and show appreciation for His goodness towards us. Right after I finished sharing with him, Mike face timed us, and Konner said, “G we are looking at what God has done for us.” His little voice raised to a high pitch, his eyes were gleaming, and he started to leap up and down. He was so excited to share with G about the Father’s blessing that it made me excited again. I thought I was excited until I saw his reaction. I learned a powerful lesson again last night. Sometimes we get so relaxed with the blessings of God that we don’t always show appreciation like we did when we first started seeing His blessing. Have you ever given someone something and they were so excited that you wanted to give them more? I’m not saying God is like that, but if He is anything like what He has created, then He is like us. We are created in His likeness. My point is don’t take anything for granted. Pause and appreciate the people and stuff you have in your life. I mean really appreciate it all. Not that superficial thank you, and I love you but pray that your heart will be connected with your words. Let people feel the love and appreciation. Mike tells me at times that he doesn’t always feel appreciated for what he has provided for our family. Thank God, he will say to me so I can make the correction. Sad to say that everyone won’t tell you how they feel, they will just walk away from you. The feeling I received from Konner’s excitement motivated me to be excited about God on another level. Don’t get me wrong, I am not tripping, and I have not walked away from my relationship with Him. We are responsible for keeping it fresh and real. I don’t want to be stale in any of my relationships, and it’s not because of what they do for me, but because I choose to be in these relationships – so, I choose to keep it fresh. Tell yourself, “KEEP IT FRESH.” Get around new Christians that are excited about Jesus. I promise it will keep you “LIT” as the young people will say. I appreciate you too, my sister! Thank God for you! Your helping me to heal my piain and past hurts. I am being encouraged! I hope to say hello personally at the Convention in August! My name isTraci Hendricks!! We do get busy with every day chores and give God a thumbs up or an IM wave as a way if sayibg thank you. But since retiring two months ago, I really enjoy being able to staying right there with Him for a while. Real nice! Thank you for the reminder. Thank you! Im gonna work at keeping it Lit💯 for Christ and Fresh daily no matter what it looks like, or feels like I will Choose to have a grateful heart!Thanks for the encouraging word and the simple reminders that I sometimes treat the Goodness of GOD with a minimum of concern. Thanks for your words, they are always helpful and on time . I praise God for allowing me to be included in this Ministry. May God continue to bless you. You are so Beautiful inside and out….. This is a great reminder of how to count it all joy even when you don’t feel like it! Thank you as always for the words of encouragement! That was beautiful and so right on. I am reminded that I need to be appreciative in a new and exciting way from my heart. Thank you. Praise God for Your Messages. We just got this word at our church last Sunday from our Pastor’s daughter. God placed this on my heart last year to be more grateful. So every time I think about what He is doing for me and my family and others who are being healed and coming out of trials, I just stop and say Thank You Jesus!. Another great and relevant topic! As I’m an overachiever in this area. How ppl feel and how I make them feel is more at the forefront of mind than myself. Moreso lately, I’ve shifted from quite a few relationships personal and professional where I’m left not feeling appreciated. It can be bothersome but I fight hard not to stay there. That’s when I turn to God, usually fussing reminding Him of my intent and to cover my heart. Appreciation goes along way and more need to be conscious of that even when you decide to move on. Ppl hearts matter to me and that’s why I so freely love to give them roses while they’re here. This was a good lesson to do a self introspect of every area! Love it!! Keep it fresh!! Dr. Dee Dee, thank you for sharing such a powerful and meaningful testimony. I will use it as a reminder to always strive to show appreciation to those who have imparted into my life and to those who have been a real blessing to me and my family. I’m reminded of something that I read a few years ago that says, “Gratitude cures bad memories”. And since what we focus on, we magnify, I choose to focus on ALL that God has done to bless and transform my life, and for the remainder of my days, my goal will be to show my appreciation to those who have helped to make me who I am. I appreciate you. Thank you for being a blessing to us and sharing your heart with us. I appreciate you!! Wow! Talk about on point and on time! Keep It Fresh! It is time to be around new Christians who will help keep me LIT for Jesus! Thanks Dr. DeeDee aaaand Konner, I truly appreciate you and this encouraging message today! Thank you Dr. Dee Dee for reminding me to keep my zeal and not take God for granted. I need to remember to pause on a regular basis to thank him for who he is. Thanks again fo being so transparent and sincere. Thank you for the message Dr. Dee Dee I appreciate you ! Even though you are so much younger than I am, I honor you, and Apostle Freeman because of who you are in the Kingdom for God, and who you have both become in my life. Let me be the first to acknowledge my failure in telling you and your entire Ministry Team how much I appreciate you/them, and how much you/they mean to me. (“Wow” please help me to write this Lord without my reply being extremely long). Dr. Dee Dee, I have professed my appreciation to so many people about you and your Ministry, but I have never expressed how much I appreciate you and Apostle Freeman to the two of you. Thank you for reminding us how important it is to acknowledge our appreciation. I honor and esteem who you are, for the work you do, and for what you represent in the Body of Christ! One evening during Bible Study Pastor Dwayne extended a verbal invitation to me to join you at Spirit of Faith. Several years later I still reflect upon that missed opportunity. Unknown to all of you, I believe so deeply in your Ministry, thus, I believe God opened a way to give me a desire of my heart, for me to fall under your Leadership by opening the door through you, for me to attend Spirit of Faith Bible Institute. The training and experience from SOFBI has forever changed my life!!! I tell everybody, at every opportunity I get to testify, about my desire to fall under your Leadership because of your Anointing…and my deepest desire to be within the Flow of God…I can only begin to express my gratitude to God for allowing me to fall under this, His Ordained Leadership….thus, this journey of mine has gone full-circle, from a member of a Word Church under Apostle and Dr. Betty Price in 1985, all the way back to their Leadership again, this time as an ordained minister, under Apostle and Dr. Dee Dee Freeman in 2019.” Only God!!! You wrote: “A Little Appreciation Goes a Long Way.” First, I shout out my APPRECIATION to GOD for allowing me to be so BLESSED to fall under THIS/HIS ANOINTED LEADERSHIP in the earth for such a time as this. You said, “yes” several years ago when I asked your permission to participate in the First Lady/Minister conference calls….only God knew where your “yes” would lead. Dr. Dee Dee, thank you so much for saying “yes” to my request…thank you again God, for giving me Your much needed LOVE and FAVOR!!! Dr. Dee Dee, I pray you hear my heart, as I have attempted to express my APPRECIATION to GOD and YOU. To God be the glory for all the things He has done! Thank you Dr. DeeDee for that. I thank God for you and I do appreciate how you cover a multitude of things from different angles to increase understanding. I am in couraged to stay focus and lean not; I know that I have the victory. I appreciate Apostle Mike and thank you both for your wonderful teachings. I truly appreciate you Dr. DeeDee! Your blogs helps and encourage me each time I read them. May God continual blessings upon you and your family. Long one but a good one😊. Thank you Dr. for sharing that much needed word. I needed THAT RIGHT THERE!!!! Sometimes, we can tend to push others away because we’re not grateful, thankful nor appreciative of their contributions to our lives. I receive this word Dr. and I’ll just begin by saying to you, “I appreciate you!” Thank you for what you are doing for the body of Christ. Your example yet speaks. Thanks again! Thank you so much for the inspirational words!!! Thank you for reminding me to keep my focus on the Lord!!! Good Read. I too often feel unappreciated by the ones I do the most for. Know I appreciate you Dr DeeDee — you inspire me!! May God continue to use you as his vessel. Thanks! Thank you for the fresh words of wisdom!!! Thank you for keeping it real. I appreciate you. Most of all I appreciate God our father!! For by Him all things were created in heaven and on earth, visible and invisible, whether thrones or dominion, or rulers or authority – all thing we’re created through Him and for Him. And He is before ALL things and in Him ALL things hold together! GOD I APPRECIATE YOU! Thank you again Dr. DeeDee; I sincerely appreciate you. 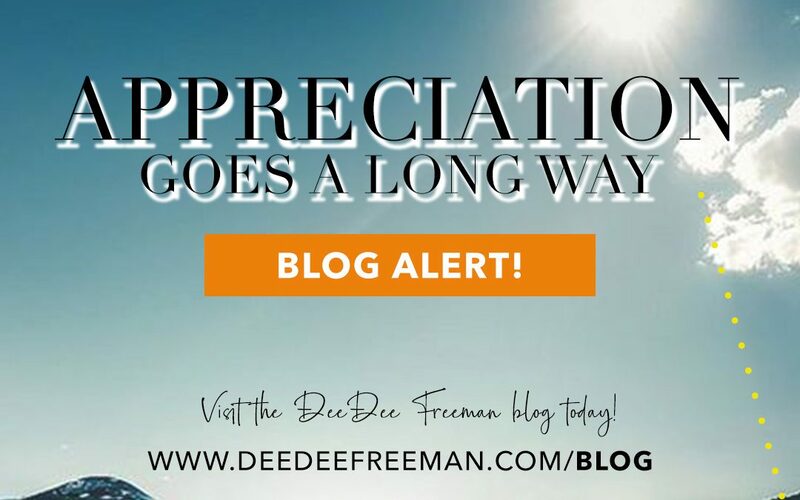 Yes Dr. Dee Dee we should always appreciate the blessing from God and not let them seem like the every day norm. Life is so precious and we need to appreciate those who love us. and let them know we love them to. We know God is all about love. Thank you so much for sharing. I needed this. Dr. Dee Dee, you have a manner, a disposition that you can make people feel so special and appreciated, without even trying. Every time I open this blog or receive GGG communications I can “hear” your voice talking directly to me. I feel emotional just typing that LOL. You’re right staying in a posture of gratitude and appreciation for this great salvation is always always the way to be and the way to go. It takes thinking, for when I THINK of the goodness of Jesus and ALL that He’s done for me, my very soul cries out HALLELUJAH! I thank God for saving me!!!!!! Oh my goodness this is so on point. Not taking thing for granted sometime we are too blessed for our own good. This is needed to keep it flesh. Thanks for sharing a right now word with us and too us. I WILL!!!!! Wow this blessed my soul! Thank God for you! Thank you sister for that fit Word…blessed my soul. Love you Dr. DeeDee. Hey Dr. Dee, I’m just seeing this! for some reason your emails go to my spam. I just finished an iConnect session, and I appreciate you for having the vision to connect more sisters in the body of Christ. I appreciate coming out of my lil circle and connecting with others. You can’t see me, but I’m jumping up and down in my spirit for YOU! !